There was one a time when ABC had a policy to never produce local versions of international formats, but in recent years it has relented, bringing us Back in Time for Dinner & Escape from the City amongst others. The broadcaster has also been working overtime to put more “everyday Australians” onto the screen. 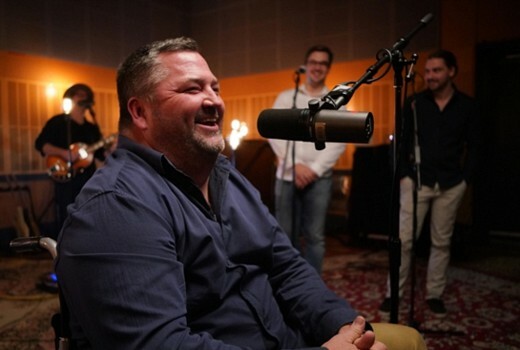 These two things combine for new music documentary The Recording Studio produced by Fremantle. This is an unashamedly feelgood format, based on a UK concept, in which people from all walks of life get the chance to professionally record that special song for someone significant or a special occasion. At their fingertips are some of the country’s top music producers, singers and musicians, all while the cameras are rolling. Get out the tissues folks, this is Australian Story with song. Each episode showcases two (or three) contrasting singers who step into ABC’s own studios in Ultimo. The first is Brissy dad John Hanley, who just loves to sing in his Pub Choir. But his voice is weakening as Motor Neurone Disease gradually takes hold of his body. He wants to record Van Morrison’s “Brown Eyed Girl” for his wife Lisa, while he is still able. “You have to live every day because tomorrow you might not be able to do quite as much,” he explains. Assisting him is music producer Matt Fell and musical director Scott Aplin. John is determined to rise to the occasion, with his sons as backing vocalists. I’m a little surprised Lisa is witness to it all, rather than appearing at the end for maximum emotional impact, but it certainly moves the pros who have never felt such meaning from a pub cover song. “Something like this really focusses why you do things,” Matt reveals. The second singer is 24 year old opera singer Aimee O’Neill, who wants to record ‘Vilja’ from The Merry Widow for her grandfather. It was a favourite song of his mother’s, who also sang opera. With assistance from music producer Mark Opitz, he is determined she will create a lasting memory. “Forget everything and just do it, get in the zone and just let it out,” he tells her. Recording in the 400 sq metre Eugene Goossens Hall, Aimee will experience joy, tears and a very big surprise. “She is walking in her great grandmother’s shoes. It’s so serendipitous,” he says. Narrated by Megan Washington, this is inspiring stuff and I suspect there will be a long conga line of applicants for a second season. The only two questions that linger in my mind are 1) why doesn’t the show feature the full song to wrap each story? ; and 2) how do we download / buy a copy? I’m tipping there will be many who want to hear them. The Recording Studio will put a song in your heart. The Recording Studio 8pm Tuesday on ABC. Caught this quite accidentally last night and was absolutely enraptured. What a wonderful show. You are right with your final points though. Considering so much has gone into the story of the song coming together, a final resplendent rendition would have been a logical way to finish the episode. Isn’t it a 45 minute show as Employable me follows at 8.45pm. Think you might have a typo there David, should it not read restoration Australia not renovation Australia?